Yorkshire may have had their England ODI quintet back on duty but it was captain Gary Ballance who stole the show once again, striking a magnificent unbeaten 152 as his side placed one step into the knockout stages of the Royal London One-Day Cup, dismantling Northants by 164 runs at Wantage Road. After Adam Lyth, Joe Root and Peter Handscomb all went for single figures, Johnny Bairstow soon followed as Yorkshire were reduced to 73-4, but Ballance continued his remarkable start to the summer and with support from first Matthew Waite and then Adil Rashid, dragged his side up to 300-6. 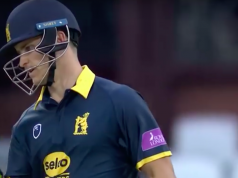 Ben Coad and David Willey then took four wickets inside eight balls as Northants slipped to 11-4 in the third over, from which there was no way back. The host’s hopes of making the knock-out stages ended with a fourth defeat out of six. For Yorkshire, meanwhile, a fifth win from six puts them three points clear at the top, in pole position for the direct qualification into a Headingley semi-final. The headline team news was the return of the England contingent as Root, Bairstow and Rashid were joined by David Willey and Liam Plunkett, all of whom featured in both ODIs against Ireland. However, Ballance has been Yorkshire’s man of the season so far, with the County captaincy seemingly having taken his game to new heights. He has made three centuries in as many Championship games, followed by two half centuries to kick-start the One-Day Cup. The start of his innings was classical Ballance, nudges and nurdles, but became the perfectly paced one-day innings, reaching three figures in 97 balls and needing just 19 more to go to 150, showing the more expansive side of his game and adding three sixes to 19 fours. It could have been different had Adam Rossington not fluffed a simple stumping when Matthew Waite was on only seven. That would have left Yorkshire 89-5 in the 24th over, but instead it was another 14 overs before another chance came. By that stage Waite had moved to a career best 43, the fifth wicket stand worth 105 before he was eventually trapped LBW sweeping Graeme White. The Northants spinner was the pick of the hosts bowlers with 2-37. He should have had three but Richard Gleeson badly misjudged a catch in the deep early in Rashid’s innings. Northants continued to be sloppy in the field, captain Alex Wakely dropping a further chance off Rashid. Just like he had with Bairstow, in the second ODI against Ireland, Rashid proved the perfect partner as he and Ballance added 113 in the final ten overs to reach 300. Ballance made a seventh one-day century in the 44th before racing past his previous career best of 139, Rashid contributing 41 before being run out off the final ball. Northants’ chase of 325 against Lancashire last Friday was the only previous time they’d chased 300, and they never looked like making it a second occurrence as Coad and Willey struck. After Coad removed Cobb with a fine delivery, that was edged behind in the second over, Richard Levi pulled his second ball straight to deep square leg. When Ben Duckett edged the first delivery of Willey’s next over onto the stumps and Rob Newton was LBW three balls later, Northants hopes of repeating last season’s quarter-final place were all but over. 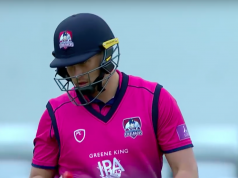 Adam Rossington hit a breezy 30 in adding 50 with Wakely, but he then gloved a Plunkett bouncer and Wakely was soon bowled sweeping Adil Rashid. 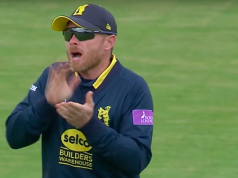 Rory Kleinveldt and Graeme White ensured the Steelbacks didn’t go down without a fight, the latter hitting four sixes in a career best 40 from 26 balls, but Yorkshire’s spin twins wrapped up victory with more than 20 overs to spare.